Let’s talk about meal planning. Wait, what? How does that have anything to do with romance? Well, it doesn’t. Except that instead of stopping at the grocery store every night on your way home from work, perusing the aisles for dinner ideas, you could be home reading. Or writing. Or whatever you do. Mainly I just wanted to write about something else for a change and it occurred to me (after watching out my kitchen window while our neighbors get delivery every night or bring home take-out while I cook) that very few people actually cook every night. Or even most nights. Or even at all. Which is fine, but if you’re here visiting my blog, I have to assume interest in cooking with at least some regularity? So I thought I’d just explain how I do it. This all started when I was working full-time, but the same principles apply now that I have more time and can make more complicated weeknight meals. So if you’re interested, cool. Read on. If not, this is an obnoxious Saturday morning life planning post and you can just skip it. Good? Good. Let’s go. We have evening activities, dinner parties, deadline days and other stuff that impacts what I might feel like or have time for cooking on any given day. For example, this week we have a 9 pm show to attend tonight, dinner reservations tomorrow, dance class on Wednesday night and friends coming to dinner on Friday. I don’t want to plan a meal for every night because that wouldn’t make sense. Incidentally, this is why I don’t love those pre-planned meal packages/printables. Not enough flexibility. 2. Check the weather/sales flyers. Believe it or not, I actually do this. Not so much for our own meals (which explains why I had salads on the menu for last night when it was 16 degrees out), but mainly for company. I don’t want to heat up the house in the summer or serve hearty stew on a rare 60 degree day in January. Also, my grocery store doesn’t have weekly sales (they have quarterly specials), but if yours does and budget is a factor, it can save a lot of money to plan around what’s on special. For example, I stock up on baking supplies in winter and frozen whole chickens in summer. 3. Have a few weekly meal staples. We like homemade pizza. And I have a pizza dough recipe that lets me make 6 or 7 freezable crusts. So on Wednesdays when we have dance class, it’s an obvious choice. I just take the pizza dough out of the freezer before we leave and when we come back, it’s ready to throw in the oven for a quick meal after our 6 pm class. If you’re super busy, you might want to have more than one of these built-in meals. Say, tacos on Tuesday or soup and sandwiches on Thursday. Just something you don’t have to think about or that takes too much effort. 4. Don’t try too many new recipes in one week. I’m a very experienced cook and I’m pretty good at looking at recipes to see how long they will take (hint: the timing isn’t always accurate–many sites underestimate and cookbooks don’t always include prep time). But even I have the occasional disaster or super late meal. I try to minimize the impact by choosing only one or two new recipes to try a week in case something doesn’t turn out as expected or I end up saving the “30 minute” but really 2 hour meal for the next night. The rest are all recipes I’ve tried before or simple meals I’ve made a thousand times like beef stew, lasagna, chili or baked chicken. Most of the time, my husband takes leftovers to work for lunch. But if he has a conference or I’ve made several robust meals in a week, we’ll have a leftover night. It’s a good way to use up the last little bits before bringing new food into the house. I go grocery shopping on Fridays so doing that on Thursdays is handy for clearing out the fridge. Mine is super simple (that’s it above) and I assign a meal to each day or write in plans that would require us to eat out or get take-out. Usually I just plan the main dish and rely on either farmer’s markets veggies in the summer or frozen veggies in the winter to round out a meal. I always have rice, potatoes and couscous on hand for starches if the meal seems like it needs one. I stick it to the fridge with magnets so husband knows what we’re having too. 6. Shop once a week (or sometimes every two weeks). I have my husband trained to write stuff we run out of on a magnetic notepad on the fridge, especially things we don’t use all the time or stuff he eats and I don’t (like peanut butter). And I add things like spices and sauces that I use while cooking. That keeps the pantry pretty well stocked. When it comes time to make a list, I made a template on my grocery store’s app that I copy every week, checking stuff like TP, kleenex, dishwashing liquid and such. Then I add any special ingredients I need from my menu, the stuff from the refrigerator list (which is often already on the template anyway) and head for the store. 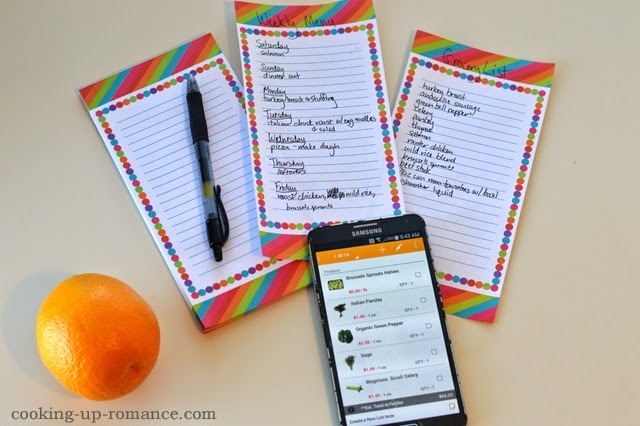 Oh, and a note on the grocery store app: it’s a huge time saver because it organizes my list by aisle. I’ve cut my shopping time literally in half. Every morning, I check my menu on the fridge and pull out any frozen meat or do any long-ish prep work (like if I need to put something in the crockpot). Then when my husband gets home from work, I’m ready to cook. This might seem like a lot of work, but it’s really quite second-nature now. And it definitely beats the days of stopping for groceries, take-out or ordering delivery every night. Instead, I can save our money for stuff like the occasional nice meal out (something we actually care about, as opposed to delivery pizza or sub-par Chinese). My family grew up cooking every night and eating together so a lot of this is second-nature to me, but I know that’s not the case for everybody. So I hope that helps someone. And then we can all get back to our romance.